When you need roofing that’s better than conventional steel or asphalt shingle roofs, choose concrete tiles. Vande Hey Raleigh offers concrete tile options that combine old-fashioned tradition with modern innovation. Rogers Roofing is one of the roofing companies who offer these hand-crafted, artistic concrete tiles, and we’d like to share with you why you should choose it for your next roof replacement. Long-Term Performance – Concrete tiles have long service lives, much longer than their asphalt shingle counterparts. 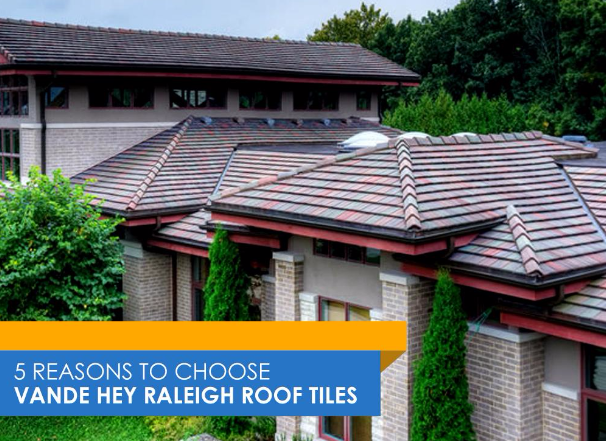 While concrete is known traditionally for being a water-absorbent material, Vande Hey Raleigh specifically engineered their concrete tiles to shed rainwater, greatly increasing its service life. Durability – In addition to its long-term performance, tile roofs can withstand high wind speeds better than typical roofing because of its weight. Vande Hey Raleigh is confident of their roof tiles’ performance that all certified roofer installations are covered by a lifetime limited warranty. Wide Selection of Colors and Styles – You probably have pictured Spanish-style villas at first mention of roof tiles, but Vande Hey Raleigh roofing tiles have several other styles that will look great with any architectural style. Options include traditional wood shake, barrel tiles, and modern slate, plus unique offerings like Cotswold tiles, based on the eponymous area in south central England known for its distinctive stonework. Doesn’t Fade or Tarnish – Concrete tiles are manufactured with the colors mixed in the material itself, instead of being applied as a layer like granules on asphalt shingles or coatings on metal roofs. This means that Vande Hey Raleigh concrete tiles will never fade regardless of continued exposure to external conditions. Low Maintenance – When properly installed, Vande Hey Raleigh concrete roof tiles require minimal maintenance for its entire service life. And if ever a part of the roof is damaged, only the affected tiles will need replacement. Rogers Roofing serves Schererville, IN and nearby areas in Northwest Indiana and Chicago. To know more about Vande Hey Raleigh roofing products, call us today at (219) 228-8210 for Indiana residents or (773) 492-2270 for Illinois or fill out our contact form for a free, no-obligation estimate.